I restrained myself from buying another watermelon at the grocery store today only because I still have peaches, grapes and blueberries to finish up. errr. But last week I made one of these babies almost every afternoon. And they were so, so good. And seriously my trainer at the gym noticed that I had eaten less calories this past week and I think this was a main reason, this was my afternoon snack and it made barely a dent in my daily calorie count. So without further delay the recipe…. Blend it all up and add more lemon or sugar water if you need. Smush up a couple mint leaves throw them in a glass, pour the ice mixture, stir and enjoy. Dissolve on the stove water and sugar (or I used splenda) in equal proportions and cool. (I did 1 C water and 1 C Splenda) it went pretty fast. I used one of those baby watermelons because I just don’t have the space for a humungo guy. 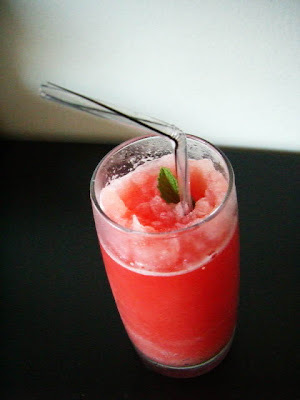 Scoop watermelon into blender, blend like crazy, strain into a container to store. Sounds refreshing! Thanks for the recipe! You so rock! I need something to beat the heat besides slushies. This sounds delicious! My waist thanks you! I’m definitely trying these out! !